ROV Innovations is proudly an authorised reseller of Shark Marine Products. Shark Marine Technologies Inc. is an industry leader in delivering new and innovative technologies to the underwater industry. Underwater technology specialists since 1984, Shark Marine's mandate is to deliver underwater products and services that are innovative, high quality, dependable and cost effective. Shark Marine has delivered on that mandate and has gained global respect for its developments in undersea technology, the expertise it brings to on site operations, and the creative solutions it delivers to unusual and challenging applications. 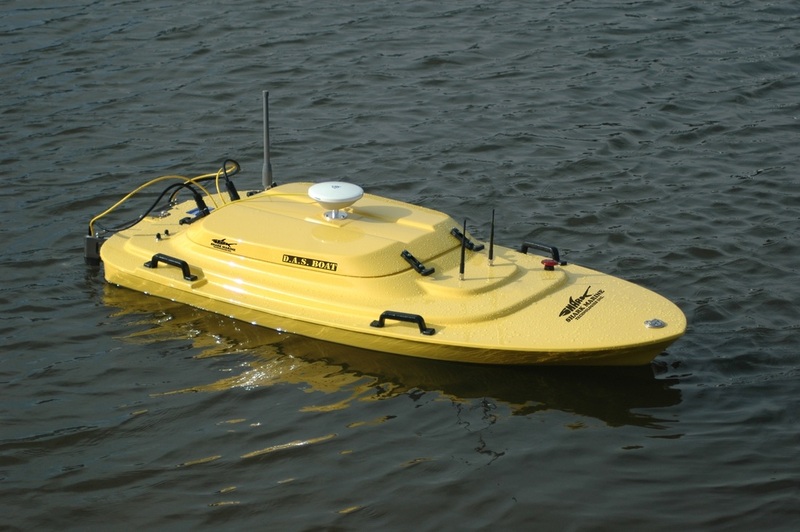 The DiveLog Automated Survey Boat or D.A.S. Boat. As its name suggests, D.A.S. 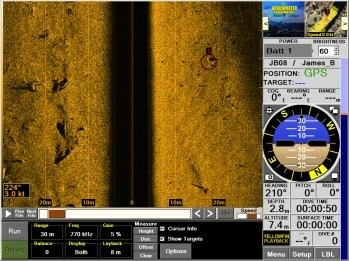 Boat is controlled by Shark Marine’s field proven DiveLog software. Originally designed to create an intuitive interface for Shark Marine’s Navigator product line, DiveLog is now being used for ROV Control, Diver Delivery System Control, Survey, and Search and Recovery Computer Topsides, as well as Autonomous Surface Vessel Control. D.A.S. Boat can be operated manually using a hand controller, or be programmed to precisely follow routes created in DiveLog. While in Autonomous mode, DiveLog sends control information from a shore station using a radio modem. Data collected by D.A.S. Boat can be viewed realtime in DiveLog and exported for processing in programs such as Hypack, Caris, and Fledermaus, or for use in Shark Marine's Sediment Accumulation Monitor (S.A.M.) Software. 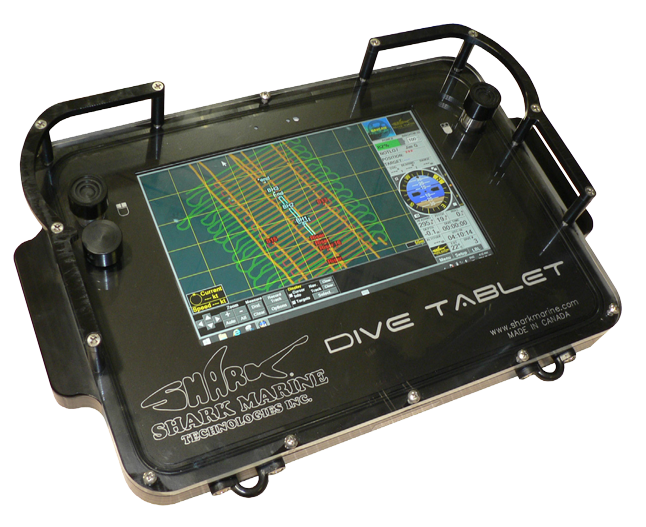 Dive Tablet is an affordable solution for anyone that requires accurate underwater positioning. Using advanced dead reckoning or GPS, Dive Tablet allows operators to map underwater habitats, document archaeological sites, take geo-referenced photos and video, or simply navigate underwater. Dive Tablet's small size and rugged construction is a good fit for use on RHIBs and other surface vessels where it can be used for navigation, or to track and communicate with divers using the Sub-NET system. Shark Marines DiveLOG Software provides a user friendly, intuitive interface managing all of the sensors and data, freeing the diver to focus on the dive. Track / Communicate with Divers using Shark Marine’s Navigator or Mako System and Sub-NET. The Need: Divers work in an environment with limited visibility making it hard to know where you are, where you are going and what is around you. The Solution: The Navigator, allows the diver to see using sonar up to 300 meters away in zero visibility, and to not only know his location but to guide him to targets or perform grid searches over charts or satellite maps. The diver continually has a total situational awareness of the environment around him. Continual Evolution: Modular design allows the Navigator to evolve, as new sonar and other underwater technologies are developed, enhancing product sustainability. The NAVIGATOR was designed to give a diver "eyes" in waters too turbid to see, for guidance in the dark without lights, for locating distant objects or targets, identifying them and for mapping the route to easily relocate them. The Navigator is a complete underwater computer that is capable of supporting many different sonar heads and numerous other sensors. Such items as the Shark Marine Pro-Mag, video or still cameras, GPS and a wide range of computer based sensors. Data collected from these sensors is stored on the processors internal hard drive and may be efficiently up-loaded either wirelessly or through wet-mate-able USB ports, to a regular topside computer. Video and Ethernet extensions are also available should the sonar data need to be viewed by observers on the topside, or shared with fellow divers down below. 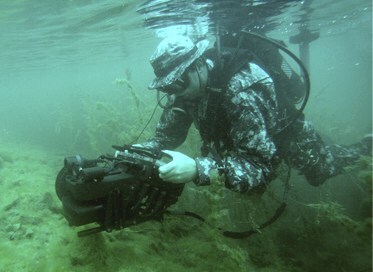 Currently in use by Navy EOD teams, SAR organizations and security personnel around the globe, the NAVIGATOR, Diver Held Sonar and Guidance System, represents the most comprehensive advancement in diver situational awareness technology to date. DiveLog is Shark Marine's core software. Originally made for the Navigator system, DiveLOG can now be used on desktop or laptop computers for mission planning, ROV Control, Survey Data Collection and Navigation, as well as playback/review of data and report generation. The Navigation view which is constantly visible and shows all important navigational information. A Primary Screen which is the main display for a sonar or other sensor. Secondary Screens which show a thumbnail view of other sensor data, and may be swapped with the primary display at the touch of a button. 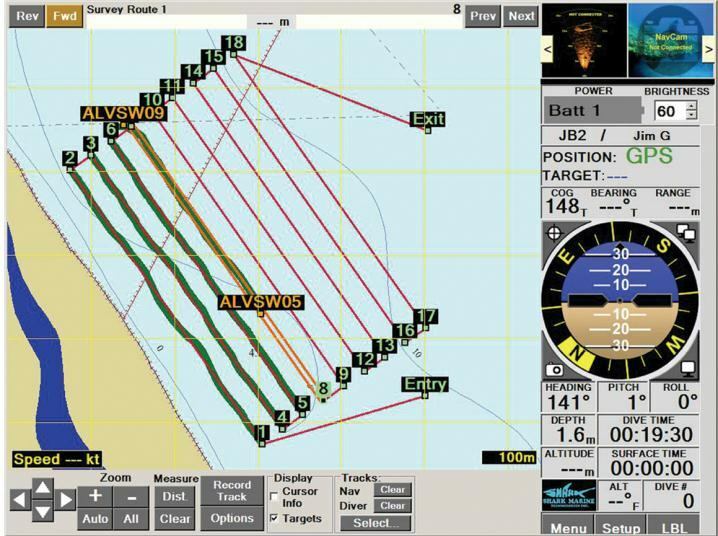 The Track Screen shows position, routes, and track overlayed onto charts, or satellite images for navigational reference. DiveLog orgarnizes all recorded data into a project folder. Marked targets will be displayed on all relevant displays such as the sonar image, track/map screen, et cetera. When a target is referenced, all data pertaining to that target may be accessed easily. 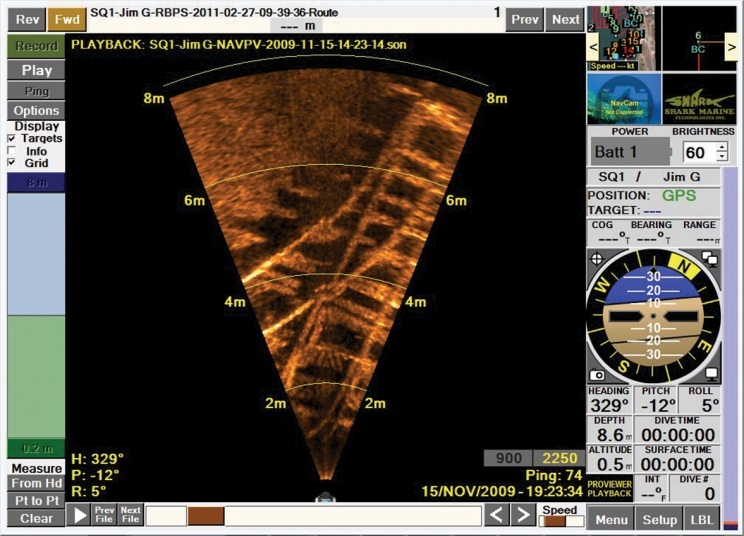 This may include sonar images, video/still images, noted comments, screen captures, location information and any other data collected from optional accessories. The Shark Survey Assistant (SSA) is a useful tool in a wide range of marine surveying applications. The SSA takes a GPS input and distributes that information to three separate ports can be connected to other surveying or navigation software. While conducting a survey, the SSA allows the user to log targets to a file for immediate reviewing once survey operations are complete. The information in the target list represents the most accurate location of the target, accounting for both layback and offset. When using the SSA, the layback can be manually entered by the user or can be set automatically by the input from a cable payout program. 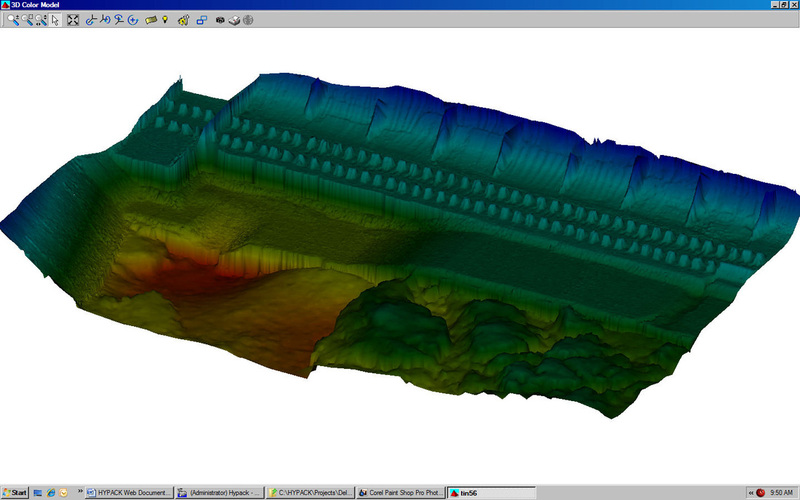 Hypack is a software package used primarily for hydrographic surveying and data processing. Hypack performs all the tasks neccessary to complete your survey from beginning to end; Geodetic Parameters, Planned Line Design, Equipment Configuration, Data Collection supporting over 200 sensors, Data Processing, Tides and Sound Velocity, Sounding Reduction, Export to DXF/DGN, Plotting of Smooth Sheets, Volumes by Section, Volumes by Surface Model, Contouring to DXF, 3D Visualization, SideScan Collection and Proccessing, ACDP Collection and Display.